Gelegen in het centrum in een historische omgeving, omringd door een zeer mooie en rustige kanalen met supermarkten, restaurants, etc. "Erg schoon en voorzien van alle gemakken zelfs een vaatwassen, wasmachine en droger. Beetje geluid van de straat maar ja je zit in de Jordaan dus hoor je mensen van de kroegen naar huis gaan, Goed bereikbaar vanaf snelweg, met de trammen op marnixstraat en rozengracht. Erg leuk ook de noordermarkt en alle kleine winkeltjes in de nabije omgeving." La atención de Cristina y Nicola excelente, poniendo todo tipo de facilidades a nuestra estancia en todo momento. Viajamos con bebé y la calefacción de la casa muy buena. Bien ubicada en el barrio de Jordaan, en una zona tranquila y a cinco minutos andando de la casa de Ana Frank. Recomendable para una visita de unos días. This was our second trip to Amsterdam, and second time staying in the Jordaan area. 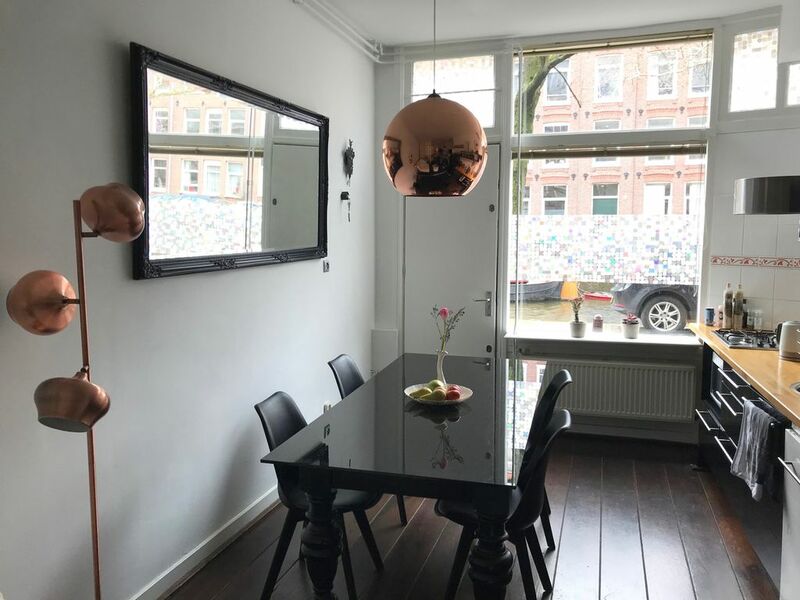 The apartment is located right on a canal on a quiet street but easily walkable to the city center and all major attractions. The apartment was comfortable for two people and equipped with all the amenities we needed. Booking was seamless, and Cristina graciously allowed us to check in early since our flight landed early in the morning. Nicola greeted us upon arrival and was a great host. We also really appreciated Cristina's list of restaurant and activity recommendations prior to our arrival. We enjoyed our stay and loved Amsterdam even more the second time. Thanks again! Christina's flat is the perfect stay!! This was my boyfriend and I's first time to Amsterdam and the location and warm welcome couldn't have been better! We were met on arrival and introduced to the flat by Nocola. She gave us tips on restaurants, music venues and day trips. The flat was tastefully decorated and much more spacious than the pictures display. High ceilings and a kitchen fit for cooking meals which saved us a lot of money. We enjoyed playing cards at the large table and watching the locals stroll by. The Jordaan neighborhood is the best of Amsterdam, with a canal just outside our door. It is out of the touristy track but a quick 10min walk to everything Amsterdam can offer. Be sure to get tix in advance to Van Gogh and Anne Frank. Thank you to Nicola for a wonderful stay. We will certainly be back to your flat!!! What a wonderful place from which to experience Amsterdam. Christina's place is like being at home, it is so comfortable and cozy--the pics really are accurate. And it makes great of the space--so much so that we got decorating ideas from it. The location is amazing, so close to trams, the Anne Frank House--which we couldn't visit (that's another story, a really nice Saturday food and flea market and a sweet little set of shops and restaurants right up the canal. And, well, the front porch is a canal! It is well fitted out with anything you'd need. Really Thanks for your words! Apartamento muito bem localizado, muito bem decorado e fomos muito bem recebidos...5 estrelas!